American artist Meridel Rubenstein began her professional career in the early 1970s, evolving from photographer of single photographic images to artist of extended works, multi-media installations, and social practice. Upon turning 70 in 2018, Rubenstein celebrated with four large public exhibitions spanning the past 25 years of her practice. This includes works from her atomic series Critical Mass, as well as her installation Oppenheimer’s Chair, which was commissioned for the first Site Santa Fe International Biennial in 1995 (on the anniversary of the initial atomic test at Trinity), as well as her newest work, a three-part series titled Eden Turned on Its Side. The latter focuses on intersections of nature and culture in relationship to ecological and social imbalance, beginning with Photosynthesis on a farm in Vermont, expanding globally to the Volcanoes of the Ring of Fire in Indonesia, and finally the site of the original Garden of Eden in Iraq. Eden in Iraq is a water remediation project in the wetlands of Southern Iraq, using environmental design and wastewater to make a restorative garden for health, cultural heritage, and environmental education. UNESCO’s recent designation of these Mesopotamian Marshes as a World Heritage Site will enable the needs and benefits of this ancient ecological and cultural jewel to be brought to the world’s stage. Exhibitions in 2018 included exhibitions at the University of New Mexico Art Museum, the New Mexico History Museum and Currents New Media Festival, with a recently closed exhibition at the National Design Centre in Singapore. Rubenstein’s new monograph Eden Turned on Its Side was released to coincide with the UNM exhibition of the same name. Curated by Dr. Shawn Michelle Smith of the Chicago Art Institute, the monograph features essays by Dr. Smith and environmental journalist Alan Weisman. Meridel Rubenstein maintains her art studio in Santa Fe, New Mexico. She has been an active arts educator for over 30 years. Since 2006 she has been a Visiting Associate Professor at the School of Art, Design, and Media at Nanyang Technological University in Singapore. From 1990-95 she was the Harnish Visiting Artist at Smith College, in Northampton, Massachusetts. 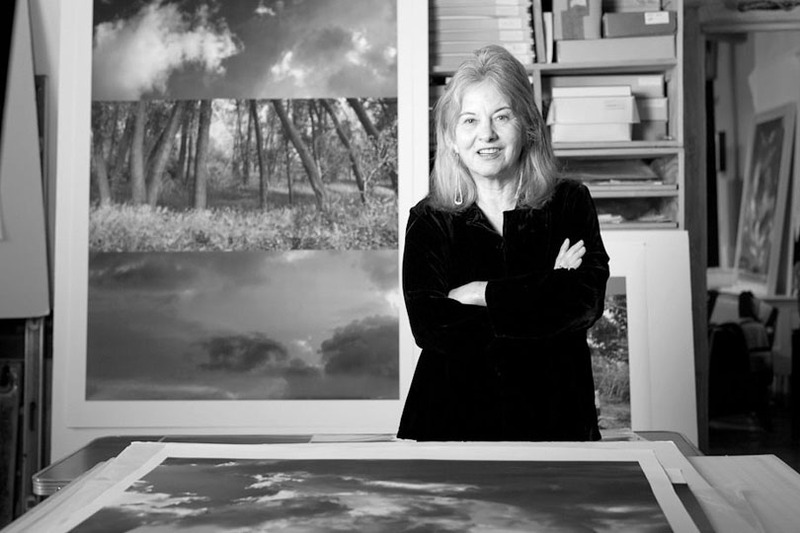 She has created photography programs at the College of Santa Fe (1976-80) and the Institute of American Indian Arts in New Mexico (1990-96) and directed the Photography Program at San Francisco State University in California, the oldest Master of Fine Arts program in the USA (1985-90). She has exhibited internationally including the Louvre in Paris and the Irish Museum of Modern Art in Dublin as well as in numerous gallery and museum exhibitions. Her works are in prominent collections including the National Museum of American Art in Washington, the San Francisco Museum of Art, and the Museum fur Kunst und Gewerbe, Hamburg, Germany. She is currently represented in San Francisco, CA by Brian Gross Fine Art and in Santa Fe, NM by Peter’s Projects. Meridel Rubenstein has received fellowships from the Guggenheim Foundation and the Bunting Institute at Harvard University, awards from the National Endowment of the Arts, as well as the Pollock-Krasner and the Rockefeller Foundations. She was educated at Sarah Lawrence College in New York and did special graduate studies at M.I.T. with the eminent photographer, Minor White. She received an M.A. and M.F.A. from the University of New Mexico, Albuquerque, in 1974 and 1977, where she studied with noted art and photography historian and museum directors Beaumont Newhall and Van Deren Coke. Meridel Rubenstein is a photographer whose domain includes sculpture, landscape design, architecture and earth systems science. She does not merely document the world, but seeks to save it.